Published in the years following 9/11, David Dark’s book The Gospel according to America warned American Christianity about the false worship that conflates love of country with love of God. It delved deeply into the political divide that had gripped the country and the cultural captivity into which so many American churches had fallen. In our current political season, the problems Dark identified have blossomed. The assessment he brought to these problems and the creative resources for resisting them are now more important than ever. 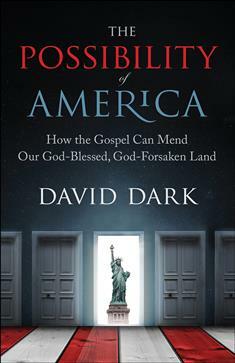 Into this new political landscape and expanding on the analysis of The Gospel according to America, Dark offers The Possibility of America: How the Gospel Can Mend Our God-Blessed, God-Forsaken Land. Dark expands his vision of a fractured yet redeemable American Christianity, bringing his signature mix of theological, cultural, and political analysis to white supremacy, evangelical surrender, and other problems of the Trump era. "The Possibility of America is sharp and merciful in that it doesn't shy away from the type of rigorous honesty and nuanced care that I have come to love and learn from every time David Dark shares his work. It is an honor to watch his conflicts and curiosities bear themselves out on the page." "This is a book built on the understanding that there is a civic imagination that imagines us into a better way of being human together. Taking Twitter, literature, poetry, music lyrics, film, television, cartoons and conversations as sacred texts, David Dark looks at the things that are held up by language: power, fear, and hatred. Dark’s work holds the hope that love is a muscle we can exercise in public—and he holds us to account for how we practice."